COMMENTS:        This trigger occurred at longitude,latitude = 73.24,16.22 [deg]. COMMENTS:        The XRT position is 1.02 arcmin from the BAT position. COMMENTS:        The UVOT position is 0.7 arcsec from the XRT position. Dec(J2000) = +05d 00' 06"
with an uncertainty of 3 arcmin (radius, 90% containment, including systematic uncertainty). The BAT light curve shows 4 main peaks with a total duration of about 40 sec. The peak count rate was ~4800 counts/sec (15-350 keV), at ~16 sec after the trigger. Dec(J2000) = +05d 00' 43.7"
with an uncertainty of 3.7 arcseconds (radius, 90% containment). This location is 64 arcseconds from the BAT onboard position, within the BAT error circle. This position may be improved as more data are received; the latest position is available at http://www.swift.ac.uk/sper. We cannot determine whether the source is fading at the present time. No spectrum from the promptly downlinked event data is yet available to determine the column density. The initial flux in the 2.5 s image was 2.21e-09 erg cm^-2 s^-1 (0.2-10 keV). with a 90%-confidence error radius of about 0.75 arc sec. This position is 0.5 arc sec. from the center of the XRT error circle. The estimated magnitude is 18.46 with a 1-sigma error of about 0.15. No correction has been made for the expected extinction corresponding to E(B-V) of 0.02. We observed GRB 170202A (Racusin et al. GCN 20575) with Xinglong 0.8-m TNT telescope at 18:29:00 UT, 58 sec after the burst. Which is consistent with report by UVOT detection ( Racusin et al. GCN 20575). The brightness of the optical afterglow is about 18.9 mag at the mid time of 69 sec afer the burst, calibrated by the USNO B1.0 star (RA=10:10:03.29 DEC=04:59:37.4 R2=14.95mag). Mini-MegaTORTORA nine-channel wide-field monitoring system with high temporal resolution responded to the BAT trigger and observed the position of GRB 170702A (Racusin et al. GCN 20575) since 2017-02-02 18:28:50 UT (T+47.8 s) and until 2017-02-02 18:39:04 UT (T + 662.0 s). The system acquired a series of 5 s exposure frames with all 9 channels pointed to the object location in white light, with and without polarimetric filters installed. No transient object is detected over this interval, with detection limit on a single frame V=13.0 mag. Co-adding 9 simultaneous frames improves the detection limit to V=14.0 mag at the mid-time of first exposure (Tmid = T+50.3 s, 5 s exposure). Mini-MegaTORTORA belongs to Kazan Federal University and is located at Special Astrophysical Observatory near Russian 6-m telescope. 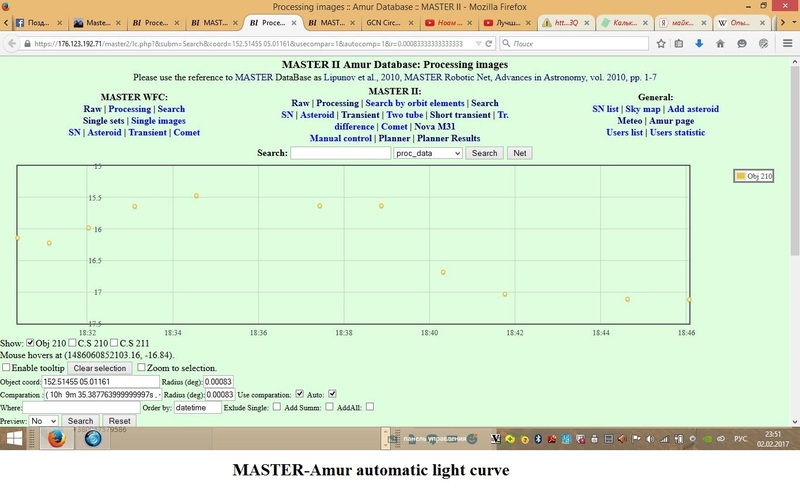 MASTER II robotic telescope (MASTER-Net: http://observ.pereplet.ru) located in Tunka was pointed to the GRB170202.77 69 sec after notice time and 85 sec after trigger time at 2017-02-02 18:29:33 UT. On our first (20s exposure) set we found optical transient within SWIFT error-box (ra=152.525 dec=5.00111 r=0.05) brighter then 17.8. 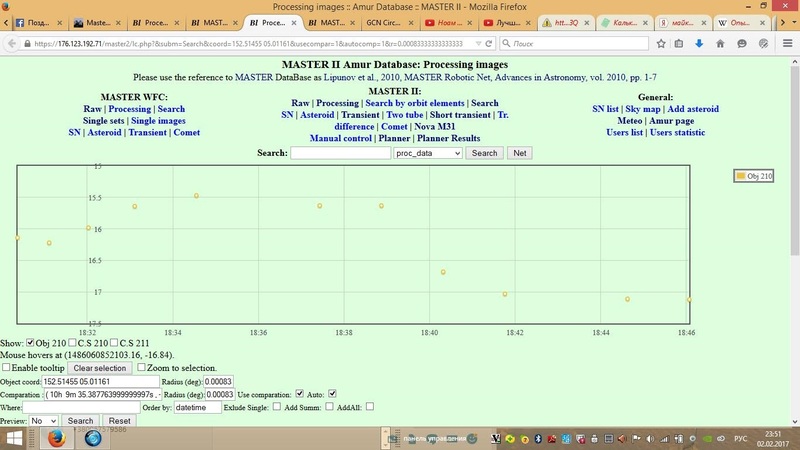 MASTER II robotic telescope (MASTER-Net: http://observ.pereplet.ru) located in SAAO was pointed to the GRB170202.77 4070 sec after notice time and 4082 sec after trigger time at 2017-02-02 19:36:11 UT. On our 18-th (180s exposure) set we found optical transient within SWIFT error-box (ra=152.525 dec=5.00111 r=0.05) brighter then 17.00. We imaged the field of GRB 170202A detected by SWIFT (trigger 736407) with the Zadko robotic telescope (D=100cm) located at the observatory - Gingin, Australia. The observations started 58s after the GRB trigger (42s after the notice). The elevation of the field decreased from 51 degrees above horizon and weather conditions were very good. The first image is trailed with a duration of 60.0s (see the description in Klotz et al., 2006, A&A 451, L39). We detect the optical transcient described by Racusin et al. (GCNC 20575), Xin et al. (GCNC 20576) and Lipunov et al. (GCNC 20578). We calibrated magnitudes using the same reference star than Xin et al. (GCNC 20576). The afterglow increases slowly and continuously from 73s (i.e. the limiting magnitude R~19) until 400s (R=16.5). After 550s the flux start to decrease with a standard temporal decay alpha=-1 until 5000s (R=19). Extrapolation with this rate gives R=22.3 at t0+1day. So we encourage to perform spectrometry. N.B. Zadko Magnitudes are not corrected for galactic dust extinction. We performed R-band and Ks-band imaging observations around the error circle of GRB 170202A (Racusin et al., GCN 20575) with the optical imager HOWPol and opt-NIR imager HONIR attached to Kanata telescope of Hiroshima University. The observations took place at 2017-02-02 18:33:37 UT (mid time of the observation). We detected the optical transient reported by Xin et al. (GCN 20576), Lipunov et al. (GCN 20578) and Guidorzi et al. (GCN 20579) in our R-band and Ks-band images. The detected magnitude of the OT and five sigma upper limit (in Vega magnitude) of the observations are listed below. We observed the field of GRB 170202A (Racusin et al. GCN 20575) with the NOT equipped with ALFOSC. Photometry in the r and i-band filter started at 22:46 UTC on 2017-02-02, 4.3 hr after the GRB trigger. r = 20.1 +- 0.1 mag. This magnitude is not corrected for the expected foreground extinction corresponding to a reddening of E_B-V = 0.02 mag (Schlafly & Finkbeiner 2011). We observed the afterglow of GRB 170202A (Racusin et al. GCN 20575) using OSIRIS at the 10.4m GTC telescope at the Roque de los Muchachos observatory (La Palma, Spain). The observation started at 23:22 UT (4.91 hr after the burst) and included observations with grisms R1000B and R1000R covering the ranges 3700 - 7800 AA and 5100 - 9300 AA respectively. The blue spectra shows a strong signal with multiple features being especially significant Lyman-alpha (both in absorption and emission), the full Ly-forest, NV, SII, SiII, SiII*, OI, CII, SiIV, CIV and AlII at a common redshift of 3.645, which we identify as the redshift of the GRB. We searched for the optical counterpart of GRB 1710202A (J. L. Racusin et al., GCN Circular #20575) with the optical three color (g', Rc, and Ic) CCD cameras attached to the MITSuME 50 cm telescope of Akeno Observatory, Yamanashi, Japan. The observation started on 2017-02-02 18:28:41 UT (39 sec after the burst). We detected the optical counterpart (J. L. Racusin et al., GCN Circular #20575 ) in g', Rc and Ic band. The measured magnitudes were listed as follows. Dec (J2000): +05d 00' 40.9"
The Swift/UVOT began settled observations of the field of GRB 170202A 84 s after the BAT trigger (Racusin et al., GCN Circ. 20575). A source consistent with the enhanced XRT position (Osborne et al., GCN 20586) and is detected in the initial UVOT exposures. No detection in the U and UV filters is consistent with the reported redshift (de Ugarte Postigo et al, GCN Circ. 20584). with an estimated uncertainty of 0.44 arc sec. (radius, 90% confidence). We observed the optical afterglow of GRB 170202A (Racusin et al., GCN 20575) using the 2.16-m telescope at Xinglong, Hebei, China, equipped with the BFOSC camera. The observation started at 18:59:32 UT on 2017-02-02 (i.e., 31.5 mins after the BAT trigger), 4x120s R-band photometry was obtained, followed by 1x3600s spectroscopy using the G4+385LP grism setting, covering the wavelength of ~3600 - 8500 AA. The optical afterglow has m(R)~18.0 mag from the first R-band exposure, calibrated with the nearby SDSS stars. Preliminary analysis shows that the spectrum is featured by a prominent Lyman_alpha trough, a Lyman forest blue to the trough, together with Si IV, C IV and other potential absorption lines red to the trough, all at a common redshift of z = 3.65. This redshift value is consistent with measurement in de Ugarte Postigo et al. (GCN 20584). We observed the optical afterglow of GRB 170202A (Racusin et al. GCN 20575) with the ESO Very Large Telescope UT 2 (Kueyen) equipped with the X-shooter spectrograph, covering the wavelength range 3500-20000 AA. Spectroscopy started at 04:10:05 UT on 2017-02-03 (i.e., 9.7 hr after the GRB) and consisted of 4 exposures of 600 s each. The spectrum exhibits several absorption features such as Lya, CIV, SiIV, FeII, SiII, MgII as well as the [OIII]5007 emission line, all at a common redshift of z=3.645, consistent with A. de Ugarte Postigo et al. (GCN 20584) and D. Xu et al. (GCN 20588). We conclude this is the redshift of the GRB. We acknowledge the excellent support from the ESO staff, particularly Fernando J. Selman, A. Mehner in obtaining these observations. We observed the optical afterglow of GRB 170202A (Racusin et al. GCN 20575) with the ESO Very Large Telescope UT 2 (Kueyen) equipped with the X-shooter spectrograph, covering the wavelength range 3500-25000 AA. Spectroscopy started at 04:10:05 UT on 2017-02-03 (i.e., 9.7 hr after the GRB) and consisted of 4 exposures of 600 s each. We observed the field of Swift GRB 170202A (Racusin et al., GCN#20575) with the 1.0 meter T100 telescope (Bakirlitepe, TUBITAK National Observatory, Turkey), starting February, 2, 20:12:45.56 UT (~ 1.7 hours after the trigger). Observations were carried out in the R filter. The afterglow is detected in the R band images with an exposure time of 300 s.
Analysis of further observations with the same filter is ongoing. We thank to TUBITAK National Observatory for a partial support in using T100 telescope with project number 10CT100-95 and technical support. We have analysed 6.7 ks of XRT data for GRB 170202A (Racusin et al. GCN Circ. 20575), from 64 s to 40.8 ks after the BAT trigger. The data comprise 131 s in Windowed Timing (WT) mode (the first 7 s were taken while Swift was slewing) with the remainder in Photon Counting (PC) mode. The enhanced XRT position for this burst was given by Osborne et al. (GCN Circ. 20586). The light curve can be modelled with a series of power-law decays. The initial decay index is alpha=2.9 (+3.3, -0.6). At T+84.5 s the decay flattens to an alpha of -1.5 (+0.0, -2.0). The light curve breaks again at T+95.5 s to a decay with alpha=3.15 (+0.19, -0.17),	and again at T+314 s s to alpha=0.01 (+0.17, -0.18), before a final break at T+2223 s s after which the decay index is 1.08 (+0.12, -0.17). A spectrum formed from the WT mode data can be fitted with an absorbed power-law with a photon spectral index	of 1.94 (+0.09, -0.08). The best-fitting absorption column is 3.7 (+6.4, -3.7) x 10^21 cm^-2, at a redshift of 3.645, in addition to the Galactic value of 2.0 x 10^20 cm^-2 (Willingale et al. 2013). The PC mode spectrum has a photon index of 2.00 (+0.13, -0.12) and a best-fitting absorption column of 5.2 (+8.8, -5.2) x 10^21 cm^-2. The counts to observed (unabsorbed) 0.3-10 keV flux conversion factor deduced from this spectrum is 3.2 x 10^-11 (3.5 x 10^-11) erg cm^-2 count^-1. If the light curve continues to decay with a power-law decay index of 1.08, the count rate at T+24 hours will be 0.018 count s^-1, corresponding to an observed (unabsorbed) 0.3-10 keV flux of 5.9 x 10^-13 (6.4 x 10^-13) erg cm^-2 s^-1. The results of the XRT-team automatic analysis are available at http://www.swift.ac.uk/xrt_products/00736407. We observed the field of GRB 170202A (Racusin et al., GCN 20575) using the SQUEAN instrument on the 2.1m Otto Struve telescope at the McDonald Observatory, Texas. The observation started at 2017-02-03 10:26:26 UT, =E2=80=8B =E2=80=8B or about 16 hours after the BAT alert. We identify the afterglow at the location of the reported GRB position, with the following preliminary results based on the photometry calibration using SDSS stars in the vicinity. We observed the field of GRB 170202A (Racusin, et al., GCN 20575) with the Reionization and Transients Infrared Camera (RATIR; www.ratir.org) on the 1.5m Harold Johnson Telescope at the Observatorio Astron=F3mico Nacional on Sierra San Pedro M=E1rtir from 2017/02 3.18 to 2017/02 3.57 UTC (9.92 to 19.17 hours after the BAT trigger), obtaining a total of 3.98 hours exposure in the r and i bands and 1.68 hours exposure in the Z and Y bands. Using the data set from T-240 to T+962 sec from the recent telemetry downlink, we report further analysis of BAT GRB 170202A (trigger #736407) (Racusin, et al., GCN Circ. 20575). The BAT ground-calculated position is RA, Dec = 152.526, 5.021 deg which is RA(J2000) = 10h 10m 06.3s Dec(J2000) = +05d 01' 15.7" with an uncertainty of 1.0 arcmin, (radius, sys+stat, 90% containment). The partial coding was 50%. The mask-weighted light curve shows a multi-peaked structure. The first peak starts at T+0 sec, peaks at T+3 sec and decays to near background by T+15 sec, at which time the second, larger peak begins. This structure peaks at T+17 sec, and the third overlapping peak has a maximum at T+21 sec, and decays to near background by T+50 sec, with some low-level emission extending out to T+80 sec. T90 (15-350 keV) is 46.2 +- 11.5 sec (estimated error including systematics). The time-averaged spectrum from T+0.25 to T+76.46 sec is best fit by a simple power-law model. The power law index of the time-averaged spectrum is 1.68 +- 0.07. The fluence in the 15-150 keV band is 3.3 +- 0.1 x 10^-6 erg/cm2. The 1-sec peak photon flux measured from T+16.04 sec in the 15-150 keV band is 4.7 +- 0.3 ph/cm2/sec. All the quoted errors are at the 90% confidence level. We observed the field of GRB 170202A (Racusin et al. GCN 20575) with the 0.5m Virgin Island Robotic Telescope (VIRT) on February the 3rd, starting at 3:16 UT (8.8 hours after the trigger), until 10:30 UT. We performed a series of exposures in the clear filter. The weather conditions were variable with a typical estimated seeing of 2". We detected the afterglow observed by UVOT (Racusin et al., GCN 20575) on a combined image (spanning times from 10h to 11.92h after the trigger). Its magnitude, estimated by comparison to nearby USNO-B1 stars, was R = 20.8 +/- 0.3. Further analysis is in progress. Magnitudes have not been corrected for Galactic extinction. The VIRT is still in its commissioning phase. We continue to image the field of GRB 170202A with the Zadko robotic telescope (D=100cm) located at the observatory - Gingin, Australia (see Klotz et al. GCNC 20580 for early measures). The observations started 19.56h after the GRB trigger and were stopped at t0+22.99h. We stacked 25 images of 180s with no filter. We continued the observation of the GRB 170202A afterglow with the SQUEAN instrument on the 2.1m Otto Struve telescope at the McDonald Observatory, Texas. The 2nd night observation started at 2017-02-04 09:45:52 UT, =E2=80=8B =E2=80=8Bor about 39.3 hours after the BAT alert. The afterglow shows the following preliminary magnitude based on the photometry calibration using SDSS stars in the vicinity. The long GRB 170202A (Swift-BAT trigger #736407: Racusin et al., GCN 20575; Barthelmy et al., GCN 20596; T0(BAT)=3D18:28:02.373 UT) was detected by Konus-Wind (KW) in the waiting mode. The light curve shows a double-peaked with a duration of ~30 s. Modeling the KW 3-channel time-integrated spectrum (from T0(BAT)+0.907 s to T0(BAT)+30.347 s) by a power law with exponential cutoff (CPL) model dN/dE ~ (E^alpha)*exp(-E*(2+alpha)/Ep) yields alpha =3D -1.16(-0.34,+0.59) and Ep =3D 247(-86,+166) keV. The energy fluence (20 keV-10 MeV) for this time interval is (5.9 =B1 1.4)x10^-6 erg/cm2. Assuming the redshift z=3D3.645 (de Ugarte Postigo et al., GCN 20584) and a standard cosmology model with H_0 =3D 70 km/s/Mpc, Omega_M =3D 0.27, and Omega_Lambda =3D 0.73, we estimate the burst isotropic energy release E_iso to ~1.7x10^53 erg and the rest-frame peak energy of the time-integrated spectrum, Ep,z, to ~1150 keV. Using the ANDICAM instrument on the 1.3m telescope at CTIO, we obtained optical/IR imaging of the error region of GRB 170202A (GCN 20575, Racusin et al.) at three different epochs: 0.41671 [2017-02-03 04:28 UT], 0.53096 [2017-02-03 07:13 UT] and 2.39175 [2017-02-05 03:52 UT] days post-burst. At each epoch, total summed exposure times amounted to 36 minutes in I and 30 minutes in J. The afterglow of GRB 170202A (e.g. GCN 20575, Racusin et al. ; GCN 20576, Xin et al. ; GCN 20578, Lipunov et al.) is detected in our early images, with the preliminary magnitudes (and 3-sigma limits) listed below. Note that the optical photometry is calibrated against USNO-B1.0 stars in the field, so suffers from a large photometric calibration error of about +/-0.3 magnitudes, which has not been included in the errors quoted below. The IR photometry is calibrated against the single 2MASS star in our field-of-view, so similarly may include a large (but unknown) calibration error. The AMI Large Array robotically triggered on the Swift alert for GRB 170202A (Racusin et al., GCN 20575) as part of the 4pisky program, and subsequent follow up observations were obtained up to 10 days post-burst. Our observations at 15 GHz on 2016 Feb 02.87, Feb 04.00, Feb 06.04, Feb 07.01 and Feb 09.00 (UT) do not reveal any radio source at the XRT location (Osborne et al., GCN 20586), with 3sigma upper limits of 451 uJy, 69 uJy, 81 uJy, 352 uJy and 105 uJy respectively.